In 2009, the Scumdogs of the Universe celebrated their 25th year of captivity in the cesspool humanity calls Earth. 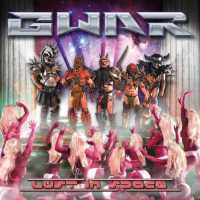 To inaugurate the festivities, Gwar unleashed Lust In Space, the band's 11th studio album that also heralded their return to Metal Blade Records. The album also saw the return of bassist Casey Orr (Beefcake the Mighty). With Lust In Space, Gwar return to their thrash-metal roots, this time creating an album devoid of any filler. From the opening title track to the closer, Parting Shot, Gwar get down hard and heavy, with throat Oderus Urangus spewing all manner of filth, from politically tinged observations to expanding the Gwar mythology. An undercurrent of new wave of British heavy metal drives many of the songs (Let Us Slay and Metal Metal Land among them), with guitarists Balsac and Flattus exchanging rhythm and lead duties at will. Complementing the thrash drive is the driving rhythm section that consists of percussionist Jizmak Da Gusha and the thickened chords of Beefcake the Mighty. Guitars are loud and crunchy and the pace remains quick, with the rhythm section adept at giving the outer edges a heavy vibe. There are also plenty of background vocals to back up the straightforward approach that makes Oderus so damn effective. Every single song is catchy, with the guitars spewing out plenty of hooks and riffs. The dramatic improvement in the music underscores the humour that remains an integral part of Gwar. From the hilarious cover image (a riff on Kiss' Love Gun) to the ever-nasty lyrics, Gwar haven't lost their touch. Here's a hilarious sample taken from the UberKlaw track: "Life's many pleasures are sure to bore/ Whether you build bombs or live as a whore." A close inspection of the words, however, reveals a plethora of political barbs that often are quite effective. As Gwar commands: "Heavy metal is the law - weakness means a broken jaw!"